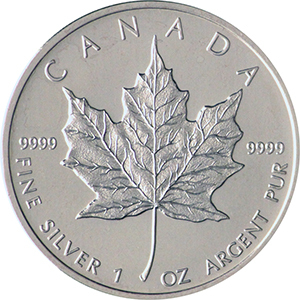 The Silver Maple Leaf is one of the most widespread silver bullion coins in the world. First introduced in 1988, it was issued by the Royal Canadian Mint to great interest after almost a decade of success with its gold equivalent. More than a million coins were produced upon its release and its production has been consistently high ever since, with the exception of a few years in the mid 2000’s. 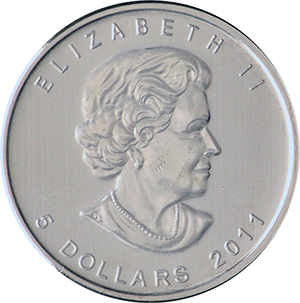 The 1 oz Silver Maple Leaf coin is the standard weight of the coin, although various special editions have also been produced. It has a face value of $5, weighs 31.11g and has a diameter of 37.97mm. it’s purity measures 99.99% and is therefore among the very purest silver coins in the world. The coin’s design has changed little over the last three decades, special editions aside. On the obverse the figurehead of the 39-year-old Queen Elizabeth II was represented by Arnold Minchin. From 1990 until 2004, this was replaced by Dora DePedery-Hunt’s depiction of the 64-year-old monarch. From 2005 until this day, Susanna Blunt’s portrait has adorned the coin. On the coin’s inverse, the iconic Maple Leaf has remained unchanged since the coin’s inception. Special editions of the coin have been various, ranging from coloured and hologramme designs to alternative sized releases. Special editions were also released to great fanfare for the 2010 Winter Olympics, held in Vancouver. One of the most popular series of coins has existed since the coins inception, the Zodiac Series. These coins represented “Chinese zodiac year of” designs, with the relevant animals represented for each of the twelve years. The coins proved particularly popular as birthday present investments for children born on each specific year. They proved so popular, in fact, that a second series were commissioned just three years after the first cycle ended in 2009.